Community • Refugee group hopes personalized IDs will help build better working relationship. The Refugee Justice League is issuing personalized cards to members of Utah's refugee community with the hope that they will help ease tension between law enforcement officers and refugees. About 300 attorneys have volunteered through the organization to work with refugees in legal matters free of charge. 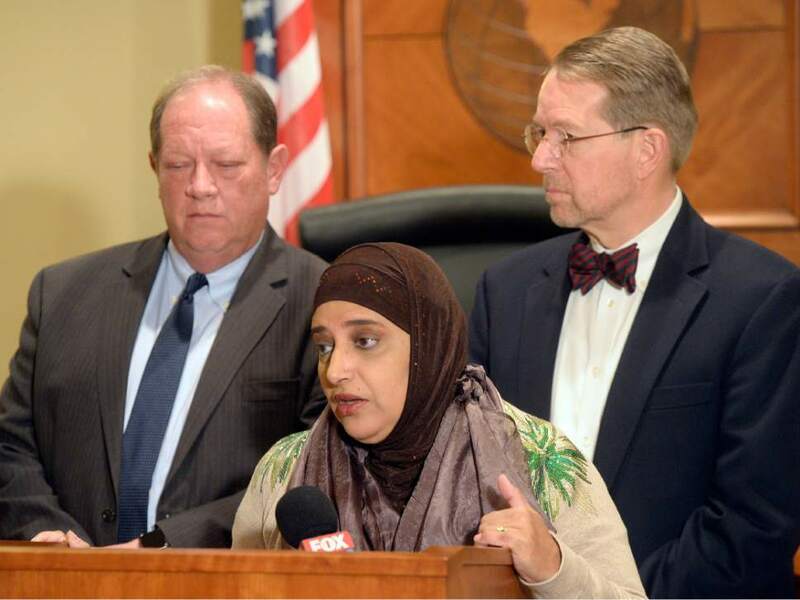 Al Hartmann | The Salt Lake Tribune Attorneys Brad Parker, left back, and James McConkie join Noor Ul-Hasan, a Muslim community leader, to announce that a diverse, nonpartisan group of attorneys and other professionals from around the state have formed the Refugee Justice League of Utah. The new organization is dedicated to promoting and defending the civil, religious, and constitutional rights of persons who are discriminated against on the basis of their religious beliefs and national origins. The Refugee Justice League is issuing personalized cards to members of Utah's refugee community with the hope that they will help ease tension between law enforcement officers and refugees. About 300 attorneys have volunteered through the organization to work with refugees in legal matters free of charge. Recent immigration policies implemented by the U.S. Department of Justice have exacerbated an already tense relationship between law enforcement officers and refugees, attorneys said Tuesday. But by issuing personalized, wallet-sized refugee cards to immigrants, the Refugee Justice League of Utah hopes to ease the tension and promote a better working relationship between the two groups by utilizing one of about 300 lawyers who have volunteered to help refugees through the organization. Many refugees come from countries where police "have been brutal and corrupt," said James McConkie, attorney and cofounder of the Refugee Justice League, at a news conference Tuesday. Government officers in those countries hunt down and kill people "without any regard for due process," he added. "Fleeing from countries where abuse from police is rampant has made refugees wary of the police authority in America," Noor Ul-Hasan, an immigrant, activist and Muslim community leader, said at the conference. In addition to that fear, there&apos;s often a language barrier, McConkie said. But with a refugee card, people can feel more confident to exercise their rights in a high-stress situation. 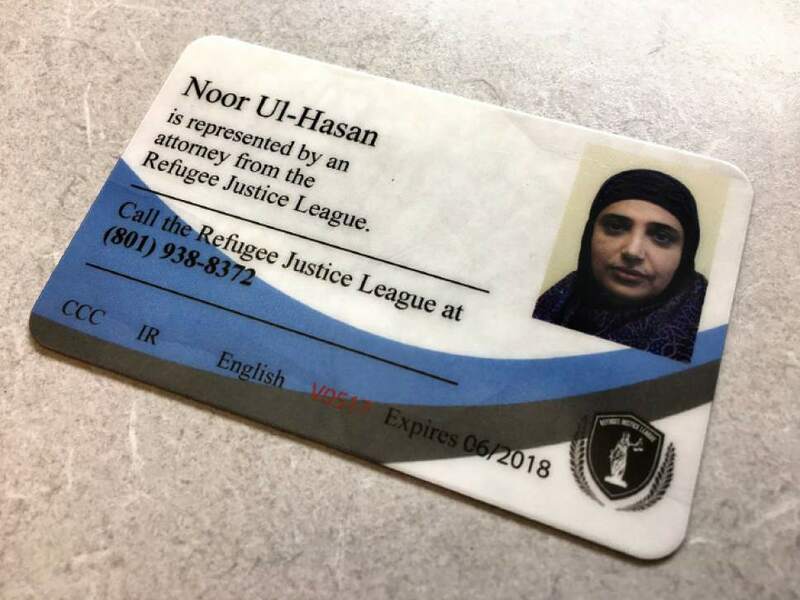 Upon receiving her refugee card at the news conference  the first issued by the Refugee Justice League  Ul-Hasan said she hopes she won&apos;t have to use it. The card includes her name and photo and states that she is represented by an attorney from the Refugee Justice League with a phone number for the organization. It also includes Ul-Hasan&apos;s preferred language and invokes her Miranda Rights by specifically stating that she does not consent to speaking with an officer without an attorney present and does not give the officer permission to search her home, vehicle or other belongings without a warrant signed by a judge. 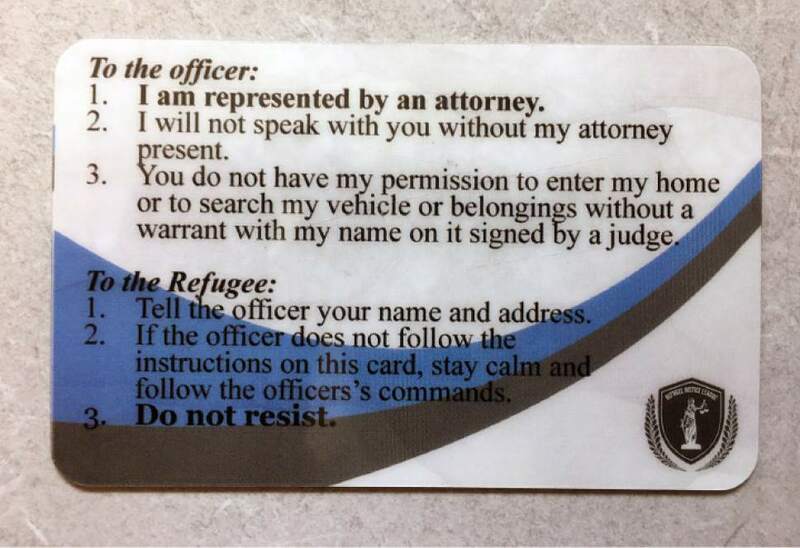 The card also includes instructions for refugees, telling them to give the officer their name and address, to stay calm and follow the officer&apos;s commands even if the officer doesn&apos;t heed instructions on the card and, specifically, not to resist arrest. Brad Parker, also an attorney and cofounder of the Refugee Justice League, said refugees also will be presented with a magnetized instruction sheet in their native language, to put on their fridge at home. It will describe when it is appropriate to use the card, Parker said. For example, he said, if a refugee is pulled over because a tail light is out, they wouldn&apos;t need to use the card. But if an officer comes to the front door of their home and begins asking questions that make the refugee uncomfortable, it would be appropriate to present the card. By using an attorney, McConkie hopes refugees will be able to avoid saying something incorrect  through a misunderstanding or mistranslation  in a justice system that, under the current presidential administration, is "not only more likely" to trip them up, but is "designed" to do so. The U.S. Department of Justice&apos;s policy under President Trump is "aggressive," McConkie said, and "doesn&apos;t sound like a policy in good faith." This has caused refugees to retreat into their homes and neighborhoods, remaining silent even when they see injustices, Parker said. "We have had a number of cases where refugees have been discriminated against and been afraid to have the Refugee Justice League step in and help because they fear inviting police into their homes," Ul-Hasan said. Parker recalled one incident where refugee parents were afraid to talk to their daughter&apos;s high school counselor about changing her schedule because they thought it might put her education in jeopardy. Salt Lake City police have spent "many hours welcoming refugees," McConkie said, but refugees&apos; ability to trust them is limited, "simply because they are police." The Refugee Justice League believes that refugees will feel safer and be more cooperative with police, either as witnesses or in cases where they have been harassed or discriminated against. Salt Lake City Police Detective Greg Wilking said the department plans to continue working with the refugee community through education programs and outreach efforts through the mayor&apos;s office. The department hopes the "ground work" it has already laid and relationships it has already formed with refugees "will be the basis of our further interaction with these communities," Wilking said, "whether the cards are involved or not."